Roving UHub photographer Mary Ellen watched an American kestrel hunting for a meal over Millennium Park yesterday. 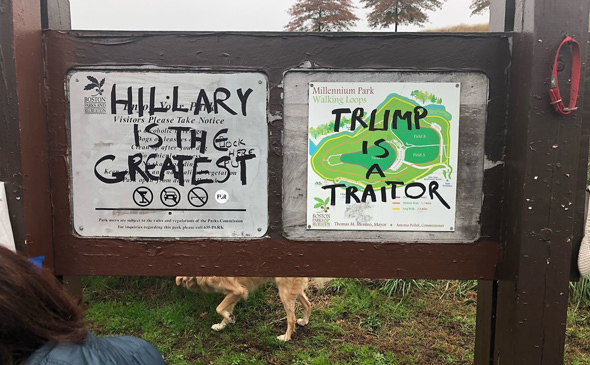 A peeved citizen files a 311 complaint about the graffiti at Millennium Park in West Roxbury, is silent about the unleashed dog right behind it. Read more. 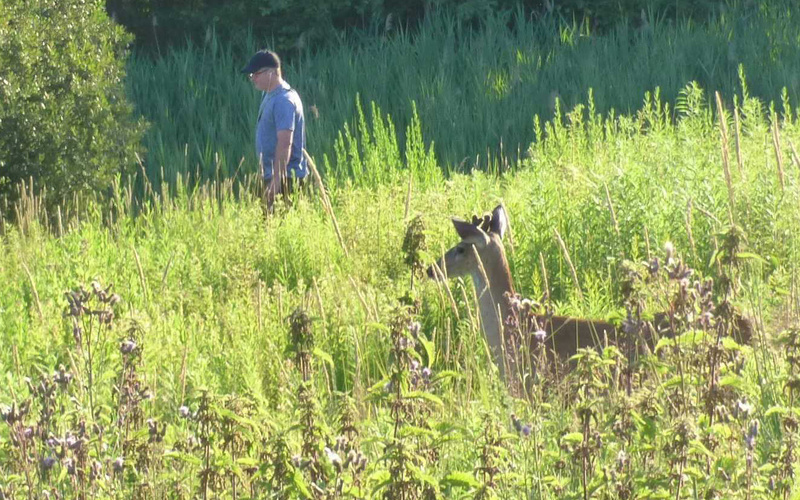 Mary Ellen watched a deer watching a man who had no clue he had two sets of eyes on him Tuesday morning at Millennium Park: Read more. Millennium Park in West Roxbury around 5:30 p.m.
Martin Ray Moser posted photos of the damage done to some of the field at the West Roxbury park by somebody who thought it would be fun to do doughnuts in a car there. This hawk warily eyed a photographer from a perch way above the canoe-launch parking lot at Millennium Park in West Roxbury this morning. 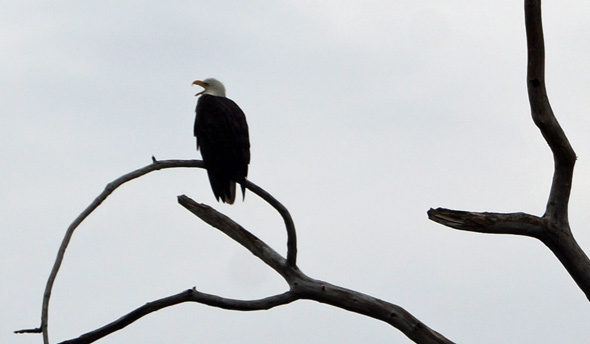 Mary Ellen went for a walk along the Charles in Millennium Park this morning and came across this young bald eagle surveying the snowy scene. 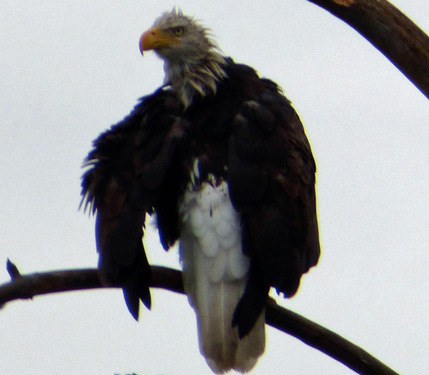 Mary Ellen spotted this drenched bald eagle at Millennium Park during the rain yesterday. 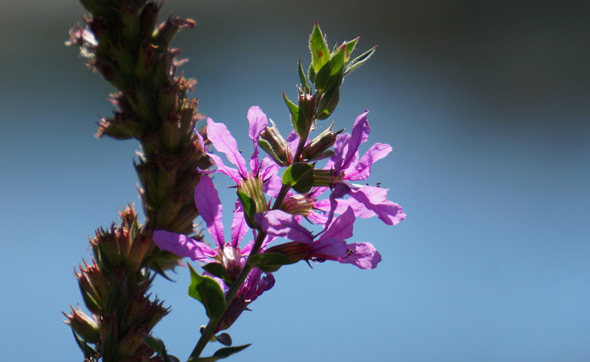 Slowly is the best way to to walk the path along the Charles River and Saw Mill Brook at Millennium Park - more of a chance to see things you'd miss otherwise, such as the small fish swimming along the river bank, the turtles sunning themselves and the small flowers on some stalks. And if you get lucky and you look across the brook, you'll realize what you thought was the top of a 15-foot tree stump is actually a great blue heron. Read more. 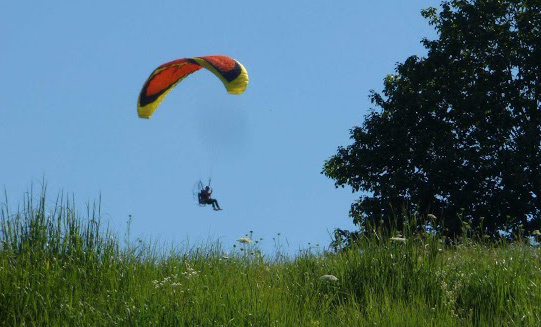 Seems there's this guy who's taken to throwing himself off the top of Millennium Park in West Roxbury, but it's OK because he has both a lightweight engine and a parachute and he flies around the Charles and Millennium Park and Cutler Park, no doubt having the grandest time. 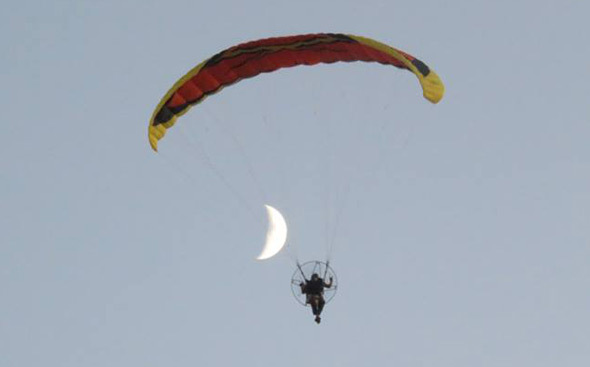 Mary Ellen captured him in flight the other day. 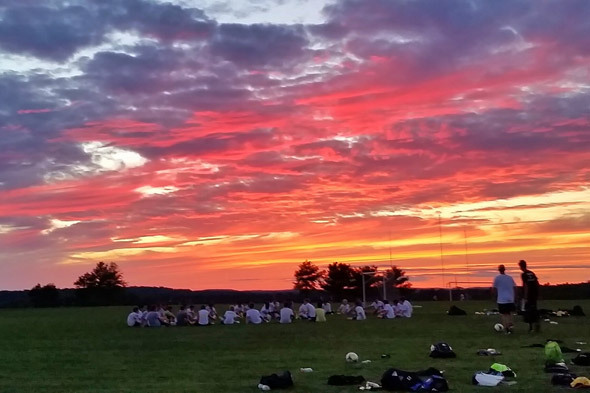 Clay Harper was at the top of Millennium Park in West Roxbury this evening for a Boston Latin School pre-season soccer camp. Around 4:40 p.m., from Millennium Park. 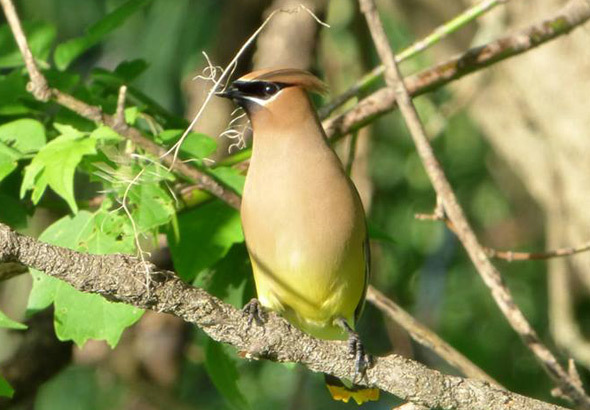 Mary Ellen reports cedar waxwings are nesting at Millennium Park in West Roxbury. 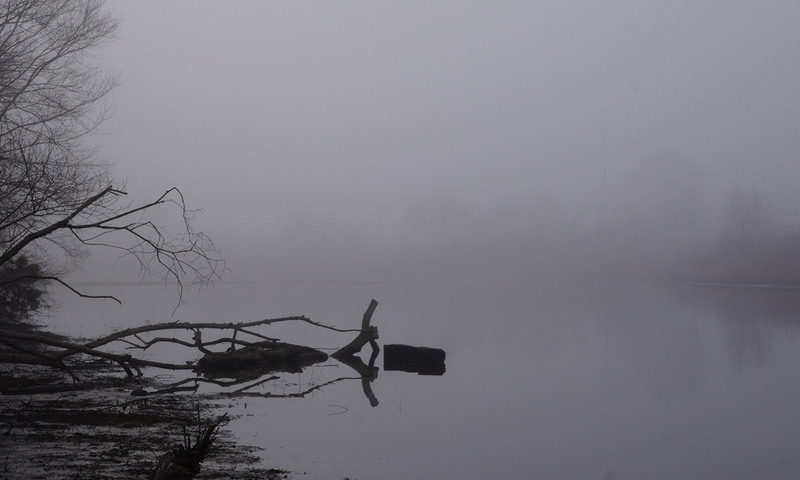 Michele Connors looks at the Back Bay from the other side of the Charles this morning. 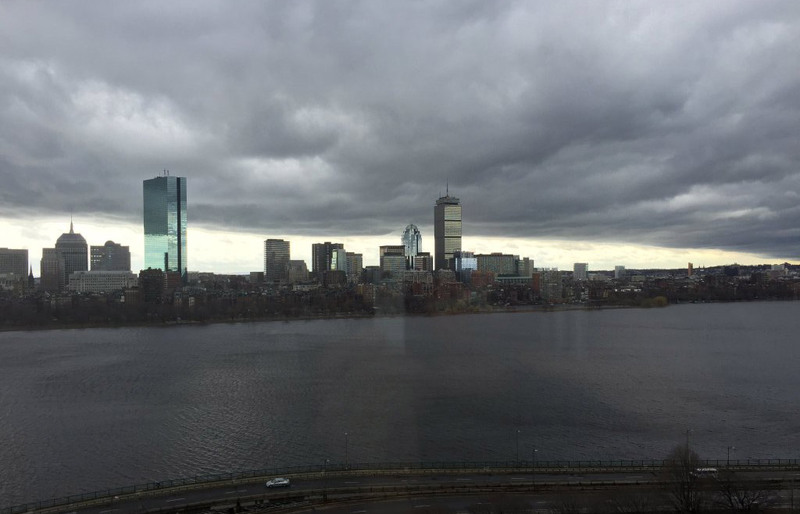 Nancy O'Connor watched the cloud move in over Millennium Park in West Roxbury: Read more. 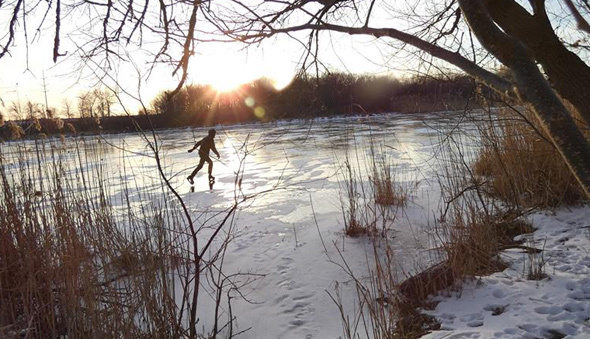 The view from the banks of the Charles River at Millennium Park in West Roxbury this morning.